In this page, you choose whether you want to create backup of all the objects or selected object(s). 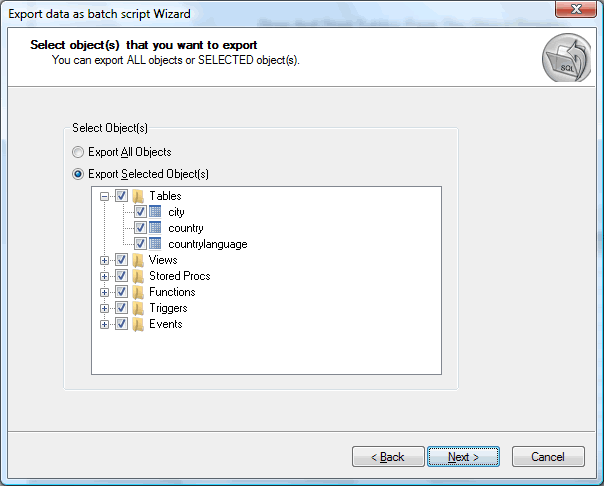 Select Export All Objects to export all the objects. If you want to export only selected object(s) then select Export Selected Object(s) and select the corresponding object(s) in the listbox. Here in the dialog box, first select the object(s) like tables, views, stored procs, functions, triggers and events to be copied from the source database. You may Select All / Deselect All by clicking on tree node checkboxes to select the object(s) quickly.